In this and the next few Workshops, we will continue with the ALP (AVR Learning Platform). We will take a look at some things that will quickly get us using more of the components from the Smiley Micros Arduino Projects kit (see below). FIGURE 1. ALP with piezo element. 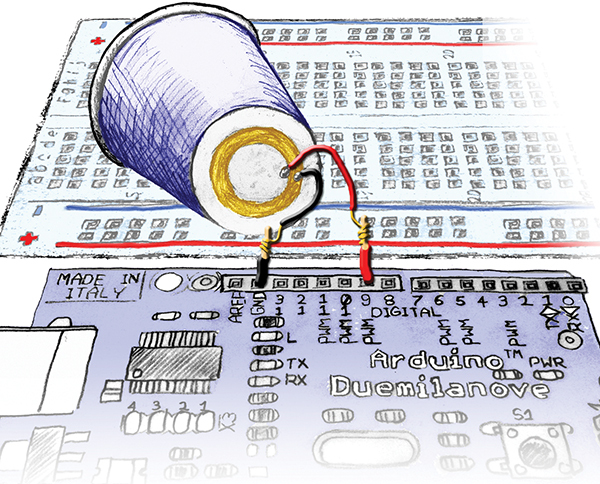 In Workshop 9, we began using a new development board — the Arduino Duemilanove — recognizing that The Arduino Way (TAW) is a very simple and easy way to begin using microcontrollers. We learned, that while TAW uses a C-like language and has an easy to use IDE, it does not IMHO (In My Humble Opinion) provide a clear path to learning the C programming language or the details of the AVR architecture — both of which are our long-term goals for this Workshop series. To help overcome this, we learned how to convert TAW code to work with the more standard Atmel AVR tools: AVRStudio, WinAVR, and AVRDude using A C Way (ACW). And, we put together the AVR Learning Platform (ALP) that uses the Smiley Micros Arduino Projects Kit. This will provide our hardware development system for many Workshops to come. For the next few workshops, we will show the code in (TAW) and leave (ACW) in the associated workshop zip files. After we finish with this introduction to using the kit parts, we will continue the series using ACW since we will want to do things that cannot be easily done TAW (such as using timer interrupts). So, if you are feeling a little confused, that’s a good thing. It means you’ve been paying attention. In the last episode, we did another communications project, learned to read the voltage across a potentiometer, and then revisited some Cylon Optometry. This time, we are going to develop a command interpreter, and then make some noise. In WS12, we learned how to send data from a PC terminal to the ALP to set the brightness of an LED. Let’s expand on that to allow us to send number commands to the ALP and then use those commands to select different functions in our software, specifically, we will use this in a little while to select some tunes. In a later Workshop, we will expand on this so that we can send words not just numbers, and pretend that we are having a natural language conversation with our AVR. We won’t be, but it can get downright spooky how well these things can pretend to be talking to you. This code is shown here in TAW. 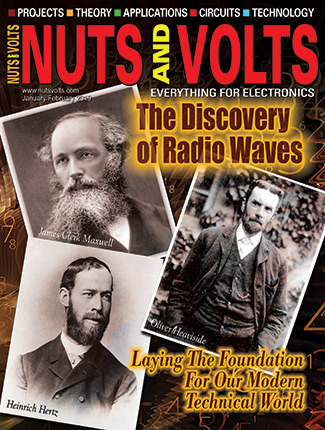 The ACW code is in the Workshop13.zip download on the Nuts & Volts website. FIGURE 2. Select the Arduino IDE serial monitor. FIGURE 3. Number commander in the serial monitor. We will be using the function cmdParse to decide what other functions to call, depending on the user input of a number. The user opens a terminal program, such as the Serial Monitor in the Arduino IDE (Figure 3), and sends a number from 0 to 4 to call one of the cmd#() functions (where # is 0 to 4). Sending any other number will cause the program to send an error message. In this example code, each command function simply sends back a string noting that the command has been received. 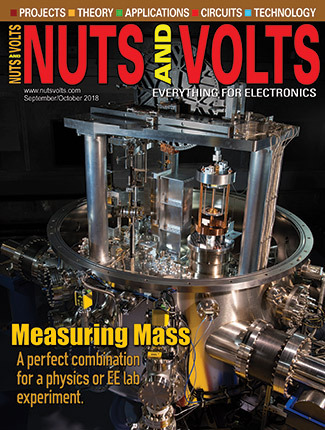 We are advised to make a joyful noise, and what better way than with a piezo element? Well, honestly, just about anything would be better — you don’t get much more low fidelity than this. 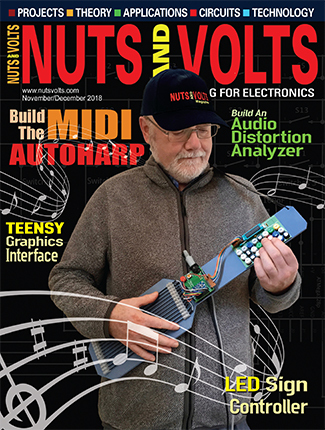 Even calling the sound it makes ‘noise’ is being generous — so, let’s ask ‘What’s cheaper?’ We are now getting somewhere since these things are cheap and don’t require any external amplification circuitry. FIGURE 4. 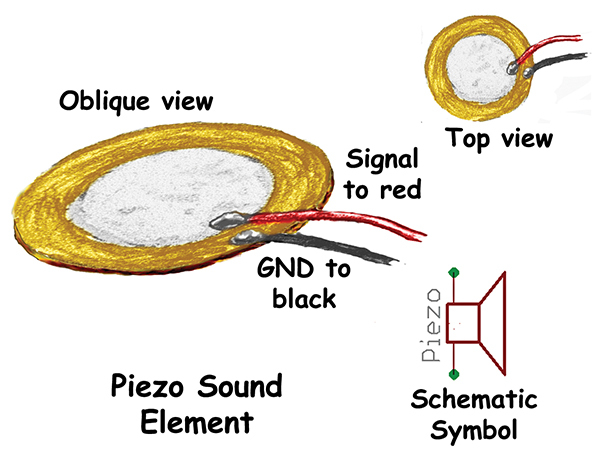 Piezo sound element. FIGURE 5. 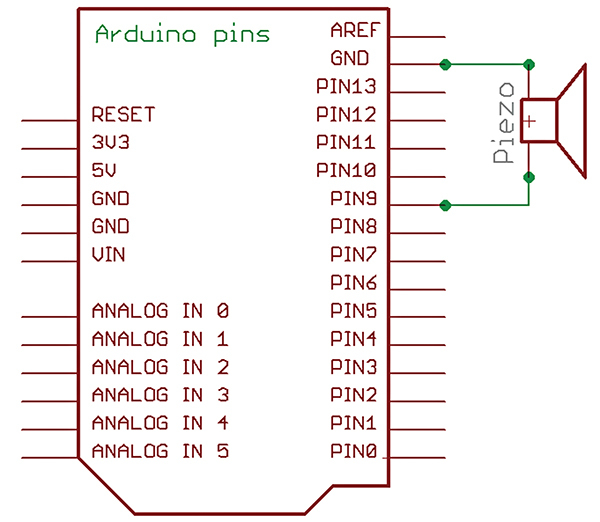 Arduino with piezo element schematic. FIGURE 7. 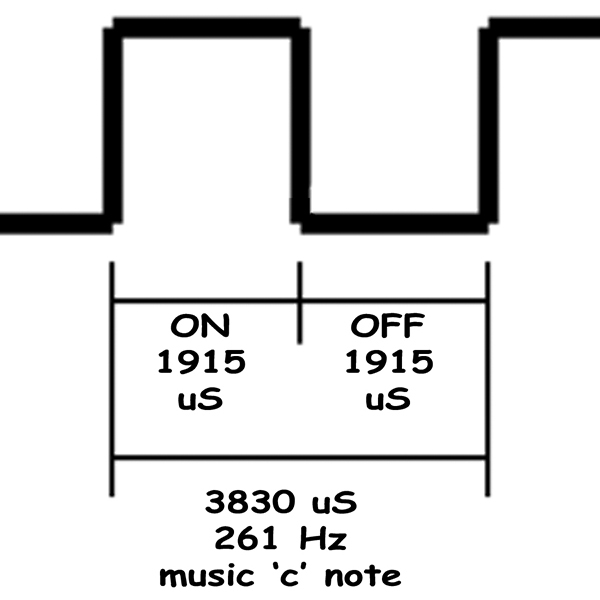 ‘C’ note waveform. The musical part of the code is based on the Arduino IDE example Melody code written by D. Cuartielles that I expanded to include another tune and some interesting noises. For us to create a recognizable tune, we need to control the musical notes (tones) and the duration between the notes (beat). 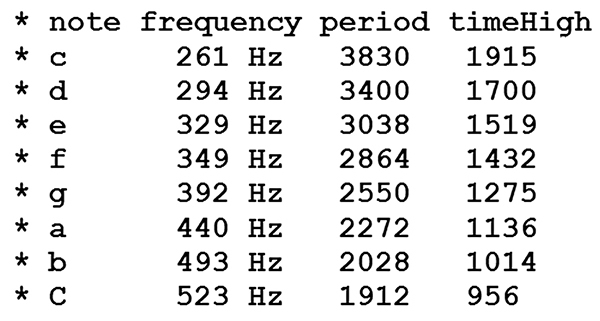 For simple tunes, we can live with eight tones (a music octave) each having a specific frequency. Each of these tones has a letter ‘note’ assigned to it by musicians as in Figure 6. In the Tunes program, we use a playTone function that takes the tone and the duration as parameters. A loop repeats the on/off cycle for the note parameter for a length of time in the duration parameter. It might, for instance, turn the speaker on for 1,915 uS and off for 1,915 uS repeating for a full second to give a rather long ‘c’ note. The playTone function is called by the playNote function that has the job of reading through the tune array to get the next note/duration combination. Each tune is played by an individual function that contains two arrays: one for the tune notes and one for the tune beat. It calculates the duration from the beats and sends that duration along with the tune note to the playNote function. The playNote function reads through an array of note names and uses that name position in that array to get the number for the microseconds needed to play that note. It then calls playTone with the tone microseconds and the duration as parameters. The playTone uses those parameters to turn the pin connected to the piezo element on and off, thus generating exquisite music like none heard since the last pterodactyl blundered into a fern tree. The Tunes source code is shown here in TAW abridged from the full code that is available along with the ACW version in Workshop13.zip. It is shortened since there is a lot of repetition in how the tunes are played. Twinkle, Twerdle, Euro Siren, and Beep Beep are in the zip file. AND a note to more experienced programmers: Yes, I know this isn’t the ‘best’ way to do this, but this is instructional code for novices. I have some comments with the zipped code about better ways and I will show those ways in a future workshop. 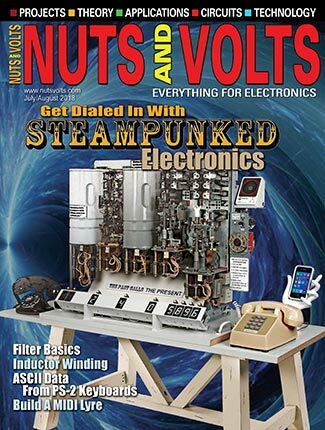 You can find the source code and supplements for this article in Workshop13.zip in the downloads section of the Nuts & Volts website and Smiley Micros website.